Over on the fabulous Beyond The Margins blog, Lisa Saffran has a great post about why teaching makes you a better writer. It also makes you a better parent. 1. Focus on Praise. This is parenting 101 here, but it’s something that we parents – (OK, me) – frequently forget. I remember attending a parenting seminar a few years back. One of the central takeaway points (and yes, I did take notes!) was that you should always emphasize the positive with your children in very specific terms. (e.g., “Well done for putting your tee-shirt on your arms and not your legs!” or “How nice that you didn’t hit your sister!”) I noticed that when I was teaching, I was incredibly positive with the students, encouraging them for everything they did, because I knew that even if they didn’t always get things right, they were giving it their best shot. Moreover, I also figured that seeing me praise those who were trying hard would motivate those who were hanging back to come out of their shells and raise their hands. And you know what? It worked. But then on the bus ride home I thought, why don’t I do this with my own kids? Instead of constantly telling them what they do wrong and trying to make them “better,” why don’t I heap praise upon their accomplishments – large and small alike – as a way of encouraging them? As I said, parenting 101, to be sure, but a lesson worth re-learning. 2. Ignore bad behavior. A corollary to #1 is that when possible, you should ignore bad behavior. Perhaps because they weren’t my own children, I found it easy to ignore it when the kids acted up in class (which to be fair to them, wasn’t all that often.) But if they said a naughty word or went off on an irrelevant tangent or did something silly or chided another child, I just carried on as if I didn’t see it/hear it and could really care less. And once again, it startled me how quickly they gave up on the bad behavior when they saw that it wasn’t getting a rise out of me. My kids fight a lot and my son – in particular – isn’t very nice to his younger sister. And while I know that he’s doing a lot of that to get “negative” attention from me, I still find it hard not to step in to defend her. But as I observed when I was teaching, that’s usually counter-productive. The more I can ignore his bullying and teasing (except when it gets violent), the less likely he is to do it. 3. Change takes time. I’ve been teaching creative writing for the past few weeks to junior high-aged students. On the last day of class, we did a workshop where the kids had to read a selection of their work (poem/story/memoir) and talk about how they’d incorporated at least two of the writing techniques we’d learned to improve their writing. One of the groups I was working with really took this on board and came to class prepared to talk about their revisions. But the other group hadn’t really done so. Which surprised me, since it was very clear to me during the lessons that they’d gotten the material. At first, I took this as a sign that I’d failed as a teacher (with this group, anyway.) But when I talked about it later with their English teacher, she said that she sees this all the time. And what she’s come to realize is that you can’t expect them to absorb everything overnight. They might well “get” what it is that you’re teaching them in class, but it might still take weeks – if not months – for those lessons to show up in their writing. This is good advice for parents as well. At least for those of us who are – cough – trying to impart certain life skills to our ten-year-olds, we need to understand that it progress is incremental. And if we lower our expectations, our kids may actually surpass them. 4. Shout as a last resort. One of the biggest differences I’ve encountered in the British school system (vs. the American one) is that it’s OK for teachers to shout at kids. I’m not here to defend that behavior – or even to analyze it. But I did notice that the teacher I worked with only shouted as a last resort. She tried any other manner of strategies with the (sometimes quite boisterous) kids short of yelling at them when they did something wrong: dialoguing, incentivizing, cajoling, ignoring. Even that old chestnut, counting to three. Again, more good advice for parents. Sometimes shouting just seems like the most efficient short-cut when you’re annoyed with your kid for setting the house on fire. And sometimes it’s useful. But it should be the last thing you do as a parent, not the first. 5. Don’t assume you know everything. When you’re teaching a class – especially if there are a lot of pupils – you can’t always tell who’s paying attention and who isn’t. Moreover, sometimes the kids who speak up the most produce the weakest written work and vice-versa. In one of the classes I just taught, one boy who never opened his mouth once produced two jaw-droppingly beautiful poems. It’s the same with parenting. You don’t always know what’s going on in your kids’ minds. So you need to watch. And listen. They might just surprise you. 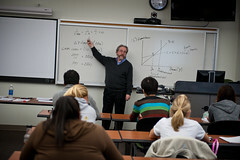 Image: Students In Classrooms at UIS 10-15-10 by jeremy.wilburn via Flickr under a Creative Commons license. Yes to all 5! Plus — wait for surprises, especially positive. Sometimes the child you don’t suspect could — just does. Of course, this sometimes works the other way around, but don’t let that discourage you. Often things you thought would work like a charm, don’t. And points you thought would be of little interest “click”. One good reason to teach — or have kids of your own.